It's January...let the challenge(s) begin! Yes, yes...I know that both time and the notion of 'beginnings' are arbitrary things - human constructs that we all agree have some significance, because we say so. In other words, January 1st isn't any better than February 1st or June 1st or any other calendar 1st. BUT...since I do follow a calendar for most things in my life, the idea of a personal new beginning to go with the start of the new year is very appealing to me. I'm still working on my 'Resolutions' post - yes I have them and I'm going to share them, later. Any way you look at it, books, books, books! I have lots of them, too many sitting un-read upon my shelf. They yearn for human touch, to have their pages caressed and for eyes to gaze upon them intently and adoringly. So, I've decided to do a couple of book challenges. According to Shelfari (my shelf by the way, come and visit me) I read twenty books in 2010 and twenty-one in 2011. While that isn't too shabby, I do have a lot of time on my hands that is currently spent interwebbing and stalking peeps on Facebook. I have no doubt they'd love to see my energy directed at something other than themselves. And so, I'm challenging myself to read FORTY books in 2012. You might be saying to yourself, "Why not just read the books and log them on Shelfari? Why participate in some challenge...what's the point?" The second part of that answer is: Because it is fun to participate in something, commit to it and see how far I let it take me. It gives me something to work toward. I'm beholden to no one but myself. If I don't read 40 books, but instead read 35...I'm OK with it, because I tried. And hey...what if I read 45? I don't know what I can do unless I TRY to do it. And, of course, it will all be tracked on my Shelfari page. This won't be the first time I've challenged myself with books. Several years ago I received a book as part of a Secret Santa exchange, the book was The Red Tent. Let me just say that anything biblical was NOT my cup of tea. Or coffee. Or...you get the picture. And since I figured it would be insulting to not make an *attempt* to read it (despite the giver never knowing whether I had or not), I decided I would give it a go and TRY it. Just a few pages, that's all I was going to commit myself. Lucky for me I was immediately sucked in and I loved it. A short time later I was given, anonymously...again, The Prize Winner of Defiance, Ohio. A memoir? Are you kidding me? I was the paranormal-crappy-lit queen. Plus, this was a time when my kids were in pre-school and what stay-at-home-mom of little kids has time to read? Before these two books I hadn't picked up bound pieces of paper with typed letters on it since before my first child was born. Glossy pages, magazine articles half a page long...that was all I could muster. But these two books...they changed everything. And so...a door was opened and a genre barrier was broken. I am still NOT a fan of romance novels or courtroom dramas or police/investigative/mystery novels or SciFi/Fantasy (maybe a little bit, but I like it mixed with reality). But, if someone were to recommend a great read from any of these genres then I'd dip my toes in and give it a TRY. I'll read practically anything...mostly. And I did. I've since read a variety of books, many in fact...and I've a taste for MORE! There are dozens of them out there right now. I decided to check out Novel Challenges based on this BlogHer post by Sassymonkey. There are several posts with links to various challenges on the Novel Challenges page. I will say this, it is easy to get sucked in to wanting to do a handful of the challenges. I want to read more historical fiction and there are short story challenges, contemporary fiction, reading novels from various parts of the world...the list goes on! There is a swirling vortex of possibility - so much to read and just 365 to read it all! The first is a challenge to read what is already on my shelf. Heh...what a concept, right? I've already posted pictures of my To-Read shelf, which now includes a couple of NEW books. Great fiction, just sitting there...longing for me to hold it. The second is steampunk. I've heard much of this new-ish (to me) genre and I'm ready to dive in. Victorian era charm with a bit of a futuristic twist - Bring. It. On! You can read a bit more about it here. Each challenge has different levels of achievement. I can read as little as 1-3 or as much as my little heart desires! It's up to me. For the steampunk challenge I'm going with Geared, which is 5 books. Off The Shelf is harder, because I have so many, many, many...to choose from. My goal is Make-A-Dint, which is 30 books. I'm starting off the year with a library book, A Discovery of Witches. I'd requested it before I found out about the challenges. My next read will be The Poisonwood Bible, which I'll be reading with Laine from The Laine List. I like the idea of reading along with someone, to discuss the book - or, as will likely be the case at times - lament how we've gotten too busy to pick up the book and how we've fallen behind on reading. Eh...I'm OK with that, too. I'm just thrilled that Laine will be doing it along with me! So, there you go. My challenge made public. How about you? Want to tag along...officially or unofficially? Let's get our READ on, baby. This is a very LINK heavy post, be sure to clicky the red linky for more info-y. I'm impressed. Not only are you challenging yourself to read twice as many books as you normally do - you're also going to take on a new to you genre. Good luck! 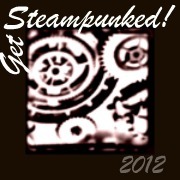 I hope you love the Steampunk - I love steampunk! I applaud your enthusiasm. You know, like from here, wayyy over here, vicariously. Like, as tempted as I am to put myself in a schedule girdle, there ain't no way I'm wearing that thing all year. So yay you! Go go go! Megan - I have a love/hate relationship with schedules. I see them as a necessary evil...sometimes. I like most of my life to be unrestricted, but then again...constraints sometimes make me work harder. VV - Oh! Wow! You rock! I want to know what you read for the Steampunk challenge!! I tried to find The League of Extraordinary Gentlemen at the used bookstore (since I have credit) and they didn't have it. I never knew it was a graphic novel! Haha, you read my post on my efforts to read around my house. But I have managed to read through the Hunger Games, and I'm almost done with them. So I might be up for some challenge... a wee little one. One that doesn't involve needing a bookstore or library nearby, lol. You are scaring me. I just picked up a copy of The Red Tent at the thrift store and hope to dive into it soon. And I'd like to read A Discovery of Witches, among the other books you mentioned. Good for you for setting goals about reading! Emily - that alone is a challenge, getting the damn books! It's such a different life, from me, that you lead. But, I'd come visit and live it for a short time...just to experience it. Melanie - It was about 10 or so years ago that I read The Red Tent. Such a great story...couldn't put it down! Let me know how you like it! I'm not going to pretend like I'll be able to keep up with your book challenge (as much as I would like to). BUT I love the idea. Love it! Once upon a time I read my way through the local library and found so many lifelong loves that I would never have picked up otherwise. Now I make a point of choosing something random off the shelf whenever I'm at the library with my kids. You never know how great it will be unless you open it, right? Read ON! You've definitely got your work cut out for you but I know you can totally do this! It's funny that you and Melanie are discovering steampunk at about the same time :). Also, I can't seem to do book clubs. I feel sort of like it becomes a class assignment and then get resentful and don't want to read. But I'll probably read after you and Laine read so I won't feel so left out.